Since Laurel was diagnosed with breast cancer we both have been much more aware of what we eat, concentrating on whole foods high in antioxidants and staying away from processed sugar and flour. It’s crazy that when you tell yourself that you can’t eat something that you automatically crave it. And I’m just a little tired of salads right now…I’ve been wanting sweet things a lot lately! Liberte Plain 0% Greek Yogurt is super high in protein and low in fat. Vega Protein Smoothie in Choc-a-lot…each scoop has 15 grams of protein and the equivalent of two servings of veggies. 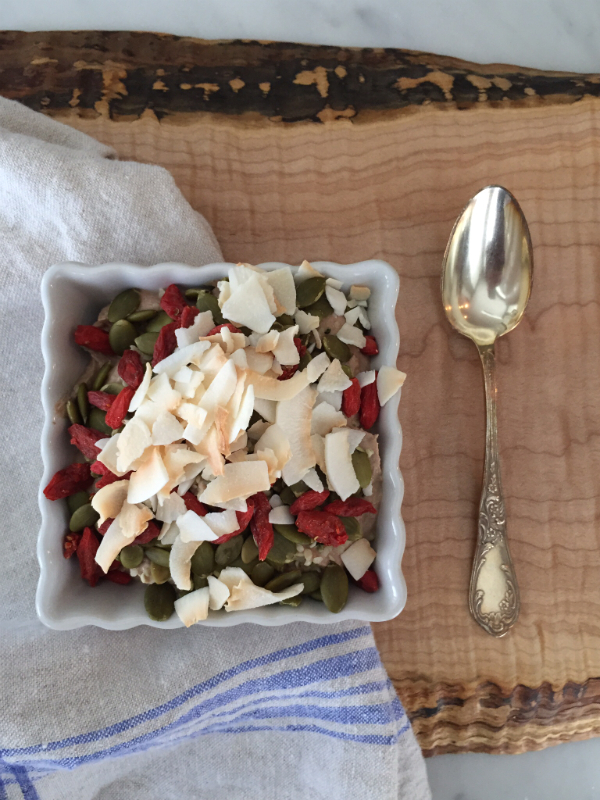 Goji berries pack a lot of punch, truly a super food as they are high in fibre, protein and antioxidants. They are naturally sweet, so they really can fulfill your craving for something sugary. 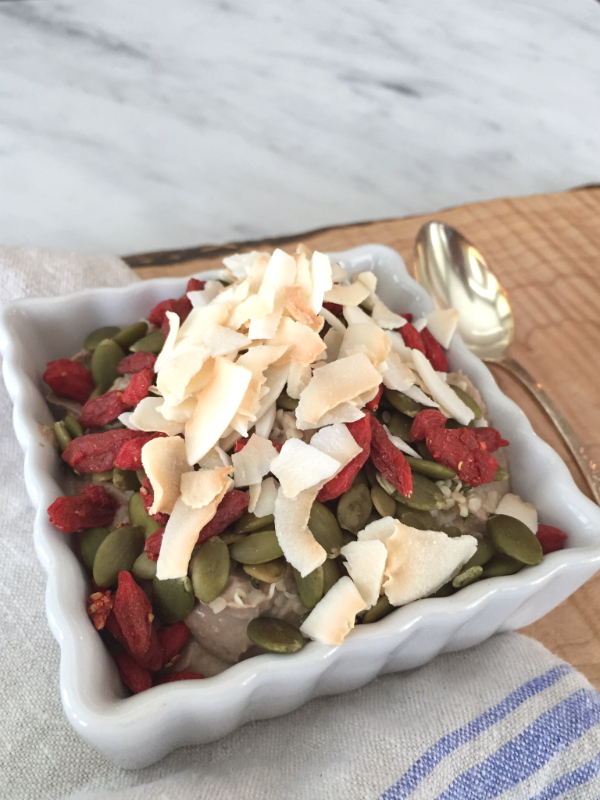 Read more about the benefits of goji berries here. Hemp seeds are a great source of protein and are excellent for heart health and anti inflammatory benefits. And they promote hair growth….I believe it as I’ve noticed that my eyelashes are fuller! Find out more about hemp seeds here. Toasted coconut ribbons…not the ones with sugar…yes, those ones are like crack and I can’t stop eating them, but I’m talking JUST toasted coconut. You can either buy coconut ribbons and toast them in a frying pan or you can buy them at a health food store. 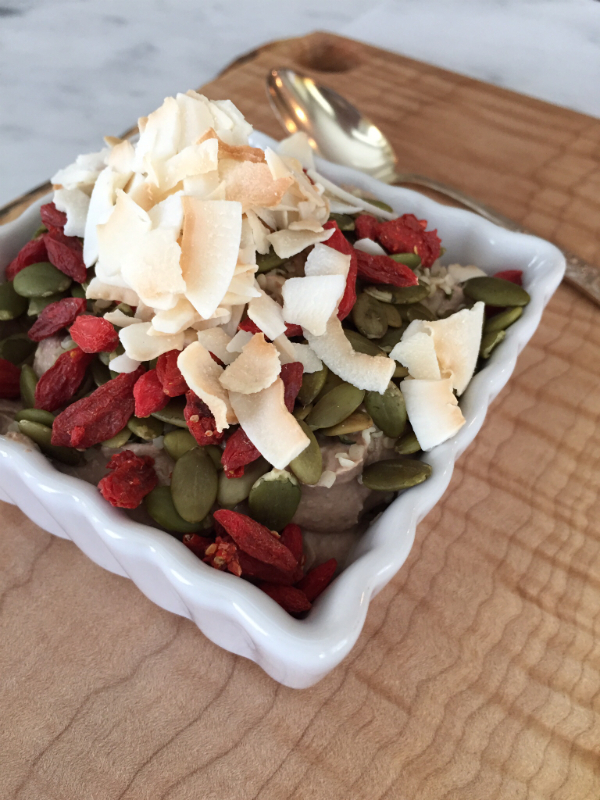 We’ve all heard that coconut is a mega super food and it sure adds a nice crunch to the parfait. 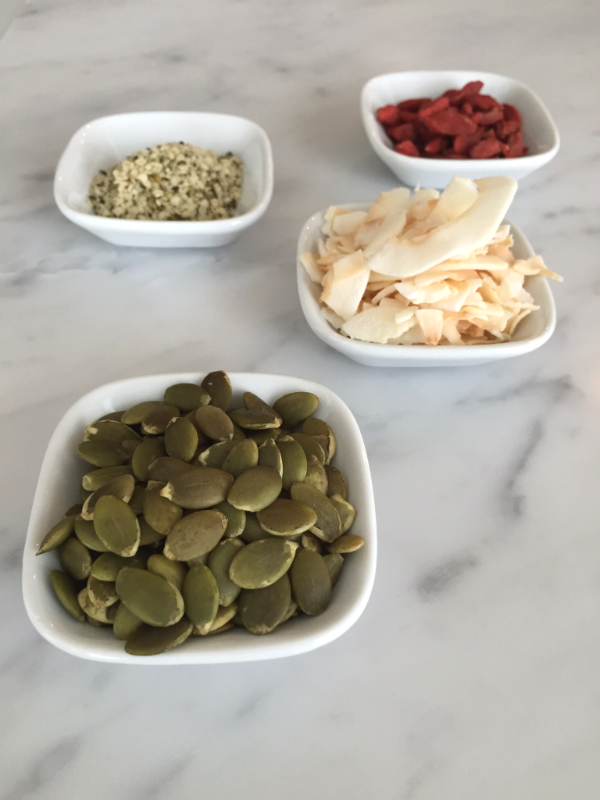 Raw pumpkin seeds are also great for the heart, have anti inflammatory benefits and more! I mix 1 cup of yogurt with 1 scoop of the chocolate protein powder until it’s smooth. 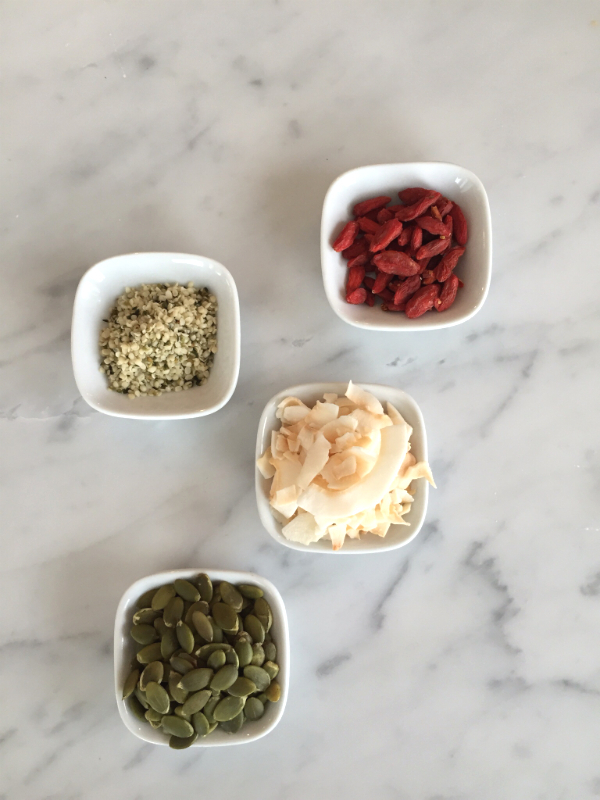 Top with about one tablespoon each of goji berries, hemp seeds, toasted coconut and pumpkin seeds. It’s a super filling and satisfying lunch and you’ll be fueled up with over 47 grams of protein! 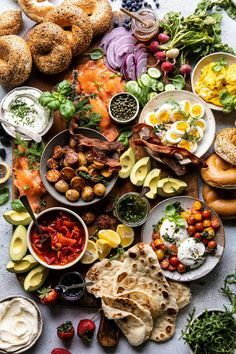 * When I know I’m going to be on the go over lunch, I’ll put the toppings in a snack size Ziploc and the protein powder in another Ziploc, yogurt in a Tupperware container and then just mix it up and top it and I’m good to go. If you just need something sweet instead of dessert or a snack, just mix up a smaller amount and enjoy it guilt-free! *based on approximate calculations. Please read labels of the products you choose to use.